A reasonable question is what the evaluation after the last subprocess is for - the process will end either way. The answer: because these are different completions - successful and non-successful. It’s nice to see it on a diagram and if the diagram is executable then we’d get the statistics of successful vs. non-successful ratio. 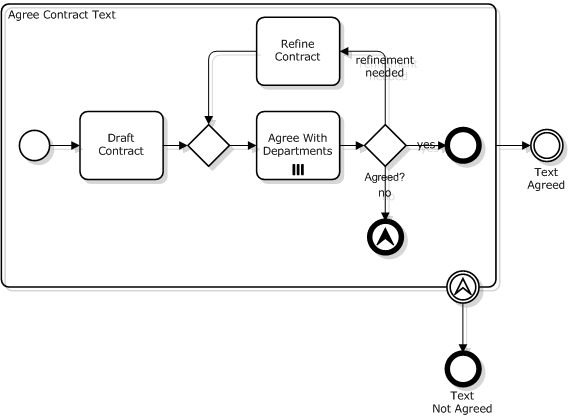 BTW, we just answered to the frequently answered question: “How milestones are modeled with BPMN?”. The answer: “By intermediate events like at Fig.3. As we can see the evaluation of whether the text was successfully agreed is performed twice. People with programmer’s background don’t like things like this rightfully pointing out that it’s a duplication. Now how can we get rid of the duplication? We can’t just draw two exits like at the next diagram. It’s a bad mistake: control flows cannot cross subprocess boundaries in BPMN. 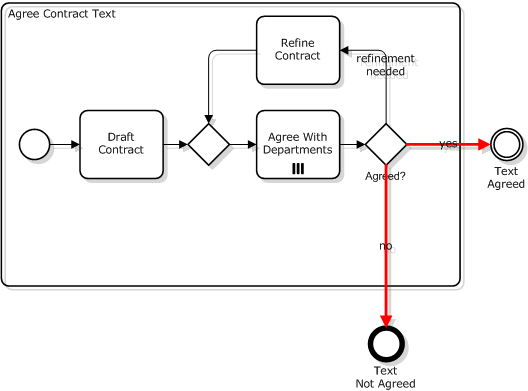 If the contract text is not agreed then the subprocess initiates escalation event and the control is passed to the attached event. Use patterns at Fig.2 and 9 to model subprocess; it’s a matter of taste which one to use. Diagrams at Fig.3 and 8 are modified with intermediate events that model milestones. If the tool supports BPMN 2.0 then use escalations instead of errors in Fig.8 and 9 like shown at Fig.7.